When Christians Make You Want To Run From Jesus! Your love for one another will prove to the world that you are my disciples,~John 13:35. The title of this post is long, but I hope to help those who have been wounded by Christians. I listened to a sermon this morning about people abandoning faith in Jesus. The behavior of those claiming to represent God is the number one reason why people choose to forego church, faith, & God. I wasn’t startled by the pastors statistics. I’ve heard and lived some of the painful stories. There were quite a few other reasons why people abandon faith, but I wanted to address this one. Christians (followers of Jesus) are human, and humans are flawed. Also our disappointment is often directly proportional to our expectation. Maybe you believe every person who claims Christ will act like Him. Maybe you’ve been wounded, betrayed, rejected, hurt, or mistreated by Christians. Maybe those in authority over you have abused that power, neglected their responsibilities to God or the flock, or you’ve been manipulated or controlled. 1. Every person in church or claiming Christ is not following Jesus or Spirit filled. Going to church doesn’t save anyone or make them better. Faith in Christ and conversion opens the door for life transformation. If you don’t believe me, read Jesus’s parable of the wheat and tare (See Matthew 13:24-30). Tare is a weed that looks like wheat when it’s growing. The wheat (true believers) and tare (non believers) grow up together. The point for us isn’t to go around inspecting people’s lives. God will separate the wheat from the tare. Some people will come to church for years and not have a conversion. Our job is to focus on our walk with God, extend grace and mercy, and allow God to transform lives. We teach and live the Gospel. We leave the transformation up to God. 2. Only God is perfect! There’s trouble brewing when we expect perfection from people. People will blow it. People will fail you. Saved, delivered, and Spirit filled people may or will disappoint you. Some great examples come from the disciples. They blew it all the time. Peter denied Jesus three times. Judas betrayed Jesus for a bag of silver. The night before Jesus was betrayed, the disciples went to sleep instead of praying with Him. They often failed to believe Him. They fought over petty things. People are not perfect. Hence the beauty of grace! 3. Spiritual growth is a process. Jesus grew in favor. He was perfect, yet walked out obedience. He began His public ministry at age 30. We learn over time. 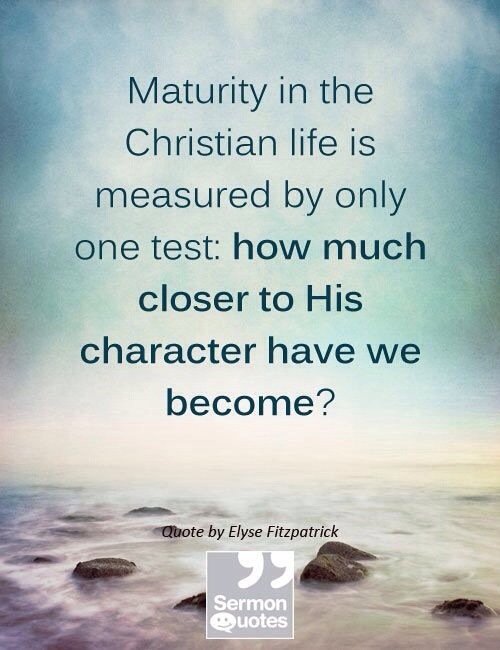 We grow to become like Jesus over time, experience, and relationship. So, even though we are transformed by faith in Christ, we are being transformed into His likeness (character) by the power of the Holy Spirit. In church you will encounter spiritual adults, teens, and babies and natural age is not always an indication of spiritual maturity. Babies are selfish, & can make messes. We don’t all grow at the same rate and every person has a unique walk with God. We all have struggles, weaknesses, and things God is working on. Lastly I will say God wants us to love one another. That doesn’t always happen. Scandals, people failing, hurt, offense, and division are all a possibility. God does not delight in our sinning against Him or others. As someone who’s had to walk it out, I won’t tell you it doesn’t hurt when you’re attacked or mistreated or betrayed by people who are supposed to love you. I will say, God heals. Hopefully these points brought some freedom. Don’t run from God, run to Him. Jesus knows how you feel. He’s walked it out too! The Father knows how you feel. He’s been mistreated since man sinned. You have an Advocate who will stand strong for you! You have Someone who will bring about perfect justice. God loves you and only His love never fails. We will talk about steps to healing next post. Bless you friends. When Life Makes You Want To Run From Jesus!